On December 19, 2017 16 year old Ahed Tamimi was arrested from her home in a pre-dawn raid at approximately 3am. Her father, Bassem Tamimi who was previously declared a prisoner of conscience by Amnesty International in 2012, reported that 30 soldiers were sent it to arrest her. The family was forced into one room in their home, while the soldiers ransacked the rest of the rooms, confiscating phones, laptops, and other possessions. Mohammed Tamimi, Ahed’s 14 year old brother was violently thrown on the ground when he tried to resist the soldiers’ attempts to take his property. Ahed was handcuffed and taken out into a military Jeep, while her family was prevented from following her outside. Later that day, when her mother Nariman went to visit her in the police station and attend her interrogation, she too was arrested and has been in prison ever since. Days later her cousin Nour, a journalism student and fellow activist, was also arrested. Ahed’s father Bassem was also detained when he attempted to attend his daughter’s hearing, but later released. Are you outraged yet? No? Try this one on for size. The Muslim community is one of great wealth. We have among us giants in all fields. We have those who take to the pulpits in our mosques every day and put out messages that reach hundreds. We host conferences and conventions with thousands in attendance. We have those who can reach millions with a single tweet or Facebook livestream. We are a community of doctors, lawyers, diplomats, social justice activists, CEOs, professors, scholars, and more. We have the ability to turn the world’s attention to Ahed and her family on our fingertips and in our smartphones. Those among us who have the ability to bring more public attention to this case should take the time to do, and they should do it immediately. Curiously, there has been a deafening silence from the leaders of the Muslim community on Ahed’s case. We all have our responsibilities, jobs, families, causes to attend to. I truly understand that. But I also understand that no one among us is feeling the burden of that silence like Ahed and her family are right now. And whatever small price we would be paying (time sacrificed, other work put on hold) to make some noise about her case is nothing compared to their plight. Ahed Tamimi is 16 years old. She is our daughter. Her mother is our mother. The fact that we have been silent on her case is disturbing to say the least. I challenge everyone reading this to take action now. If you are an individual who Allah (SWT) has blessed with a voice, a platform, a following, lend it to your sister and spread this information to your followers so that they too can take action. We pride ourselves the values our faith instills in us: Our brotherhood, our compassion, our obligation to stand up for the rights of others. It is time for us to act. Please see the list of action items below and share this information far and wide. 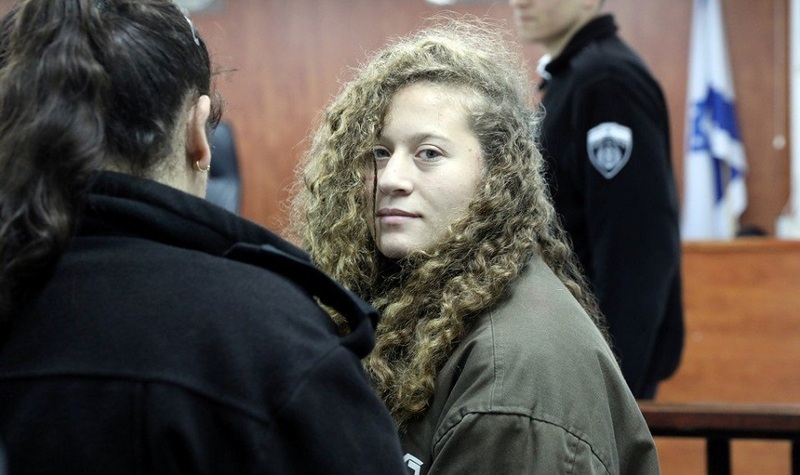 The more action we have on her case, the more pressure we are putting on the authorities to release Ahed. Every night we do not act is another night she spend on the floor of a cold dark cell. I am humbly asking you to do your part to change that. AM Pacific, 1 PM Eastern, 6 PM UK, 7 PM in Europe, 8 PM in Palestine – updates and hashtags are posted regularly on Facebook and Twitter. (202) 224-3121 and ask to speak to your Representative’s office. CODEPINK has an action to highlight this case specifically. *This list of action items has been compiled by Samidoun. We deleted 19 spam messages. When will the Islamic world stop using Palestinians to forward jihad? When will Palestinians know that their lives are worth more than a Jew’s death? When will the Palestinians’ Arab brethren in Lebanon give them full rights and allow them to access all jobs and buy land – like Israeli Arabs can in their country, Israel? When will people care more that thousands of Palestinians have been attacked by the Islamic State in Syria in which thousands were killed? Will people ever wake up and reject being dominated by a set of laws and ritual methodology dreamed up by a psychopath, a leader who pillaged, incessantly r a ped, dismembered limbs, decapitated innocents? Or will they just seek to force convert and abuse and dominate those who do (as been done in all lands consumed by Islam – whether previously Buddhist Afghanistan, Hindu Pakistan, Christian Constantinople, etc? No conquering army has ever cared enough about Jerusalem to make it a capital. Jordan had it last and not only did they not make it a capital, they didn’t set it aside for a Palestinian State (a first Palestinian State ever if there is to be one). This pseudo care about a people, or in this case, a girl, who are really harmed by the same ideology that harms everyone in the neighboring countries for thousands of miles, is really not going to help bring happiness to the world and certainly not to them – if happiness in this world matters. They can all still pray on the Temple Mount while turning their backs on Al Aqsa while Jews and Christians, per orders of the Islamic Waqf who Israel granted guardianship – are prohibited from praying on their holiest site. That is apartheid. This desire to eliminate Jews from Israel is holding up peace – but then again, peace isn’t really the goal of Islam, it is submission, submission to what – really? Enough. Palestinians will be able to have their first state ever when they can behave as if their life is worth more than a Jew’s death. It isn’t the Jews who strip anyone of rights – it is the ideology of Islam who strips all humans of rights. As long as Islam rules, there will never be a “free Palestine” like there is no”free Iran,” “free Egypt,” “free Saudi Arabia” “free Yemen” “free Afghanistan” etc. Please be intellectually honest and stop this facade. It hurts a lot of people – including those the Islamic world feigns caring so much about – while treating them dismally. Palestine can never be free as long as the dominant religion is a set of laws and rituals dreamed up by a psychopath who had 19 wives and concubines (not at the same time), acquired many of these poor women by slicing the heads off the men they loved or conquering their tribes (see wikiIslam Muhammad’s wives and concubines page). The fifty seven Islamic states forming the OIC are human rights pits because they lean on harmful methods and laws as Divine and revere a psychopath as a prophet. He was a pillager, caravan thief, bully, r a pist, etc. “Palestine” will only be as free as the Islamic ideology allows anyone to be free – and without laws of the West protecting individuals – that is quite small. Israel is the only sane place in the Middle East – and this girl seeks to destroy it – because she simply doesn’t know better. In the West – you do (or should). If the Islamists took Israel – it would be as “wonderful” as when Islamists took Egypt from the Egyptians, Afghanistan from the Buddhists, Pakastan from the Hindus, Turkey from the Christians, on and on. When is enough damage enough. Islam is a really bad ideology hurting all those who practice and those who are targeted by the practitioners. Check out Ex Muslims of North America – be free. So tell me Nessie what is the Zionist religion, we know the Jewish religion is Judaism but what is theirs. The Zionist fight has nothing to do with religion, it’s about a bunch of thugs trying to steal someones country. Throughout history no religion has ever owned any country, religion is about owning souls converting people to their beliefs; zionism is far from that. A bunch of thugs selling the holocaust as their defence to ownership, for 70 years the occupier has played the victim, as victims you have the weapons you hold a sovereign nation under siege, still you say you are the VICTIM. If you are the victim, what are the Palestinians, all they have is the support of HAMAS, who were duly elected democratically by the Palestinians, still you say this is not right. I’m hoping Nessie you can explain why you think you are the victims and why it is in the interest of the Knesset to endlessly play the FEAR and Victim card. “The Zionist fight has nothing to do with religion, it’s about a bunch of thugs trying to steal someones country.” Classic. There are 57 Islamic human rights pits called countries that have been stolen from other people and you cry victim because Islamism hasn’t been able to sink its fangs into Israel. I know your kind and I’m already bored. Tutaloo. Bored because you have no words to support your lies, go away and hide, or tell us something why you think you live in fear from the Palestinians, they throw rocks very dangerous, you retaliate with ak47, rubber bullets, and various other projectiles. Go away Nessie you poor poor victim go and hide, you might get hit by a rock. Go find some facts don’t try and exploit the Holocaust you were not there. Stone throwing has kill 17 people in Israel. Stone-throwers also employ catapults, slings and slingshots armed with readily available materials at hand: stones, bricks, bottles, pebbles or ball bearings, and rats or cement blocks. You have been proven wrong at every turn. Perhaps you should go away and do some research. Ahed Tamimi has been caught on video assaulting police officers and other Israelis for years. In most lands, that is illegal. Wonder what would have happened if she ever assaulted a Hamas militant or a member of the PA or Turkish police, or Egyptian police, etc. Aren’t you all tired of the hypocrisy? As have the IDF, have been caught on camera numerous times abusing children, runing them over, shooting children, kidnapping children, now what were you saying who was caught on camera. Get your head out of the sand and face up to the fact the IDF are CHILD ABUSERS, there is no other name for it. Could you please guide me to the links of the specific accusations you accuse the IDF of doing. I am not aware of them running over children (although that is a tactic started by the Islamist Palestinian Arabs against Israelis that has been exported to Nice in France, London, New York, Ohio, Stockholm, etc). I could link you to images of those events if you have trouble familiarizing yourself with them. IDF does need to respond to the killer mentality of people following the ritual methodology and set of laws dreamed up by a psychopath who wanted wealth, killed those who worked for it – enslaved the women and children, etc. Sadly that might mean that there are unintended casualties – which is morally better than the intended casualties inflicted by those aiming to spread Islam. Israel is the first in the line of war against further conquest. And – it is the happiest place in the Middle East – especially for Israeli Arabs. Goooooo Israel! Yay! You tube or are you that ignorant you don’t know how to even use google? Seriously, where Hamas has forced children to dig their terror tunnels – where over a hundred have died from that task and where they prohibit women from participating in sports and the Palestinian Authority arrests and abuses students and journalists and the Islamic State has displaced thousands of Palestinians from Syria (never mind the hundreds of thousands of Muslims fleeing and killed), your self righteous indication is as nauseating as it is disingenuous and anti Semetic. But you already know that and you don’t care – you just don’t like it being pointed out to you publicly. And of course you have proof of this hey Nessie, or is this another one of the zionizt lies. But please – certainly you aren’t surprised that there is abuse against journalists, children and women in Islam whether it be among the Palestinian Arabs, Saudi Arabian Arabs, Iranian Persians, Turks, etc. It is time to open your eyes to the real world and the facts that are either deliberately kept from you – or you deliberately keep away. Ahed Tamimi is 18, old enough to vote (if they allowed voting) and old enough to know that abusing soldiers will get you locked up. I can never find this so called footage of Israeli soldiers abusing children, runing (did you mean running) them over, shooting children, and kidnapping children. It’s not a fact until proven to be. So called Arab Palestine is just another Muslim dictatorship and you are just another small minded individual that bought their propaganda. Most children in Gaza and the Judea and Samaria area are killed by their own family’s in “Honor Killings”. Oh the poor soldier, couldn’t defend himself from a child, what an excuse for a man, he was no soldier if he was been beaten by a child. As for Muslims not helping , there are many out there protesting organising rallies throughout the world. Do you know at all what’s going on around you? You know what… if she has been in Egypt, Iran even Jordan or Syria doing that to a solder she will have had smash her face and had been sent to hospital, if she was lucky enough, with broken arms and fingers…. you got it… the soldier was extreme patient with her and that is why they abuse the soldiers, they are extremely educated that can be seen as a fool, but you saw what happen then later, they came and arrest her and she will be there until she understands that she can not do that again.